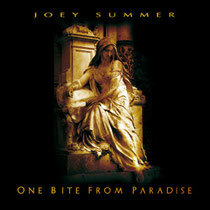 Brazilian artist Joey Summer 2nd solo album ONE BITE FROM PARADISE will be released from Perris Records on February 7th 2012. This album feats again the great songwriter and keyboadist Fredrik Bergh (Bloodbound, Street Talk) in the song “Heaven To Earth” penned by Fredrik and co-written in partnership with Joey Summer especially for this release. Also the album brings another two especial guests: Frédéric Slama and Tommy Denander who also played all the instruments in the track “No One’s Gonna Hurt Me Anymore”, penned by Frédéric Slama and Sarah Fontaine (Chaising Violets).